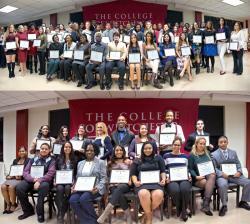 CW honored and inducted 69 students from Phi Theta Kappa, 22 students from Sigma Beta Delta, and 4 students from the CW BBA Honors Program. High School juniors and seniors now have the opportunity to earn 3 college credits at CW while still attending high school. Includes a 3 credit course, eBook & iPad Mini.